Just a BRAND NEW lot of 4 each 2" Wide x 06' long Heavy Duty Commercial Grade Ratchet Buckle Utility Straps with spring E end fitting and HD S Hook end fitting. 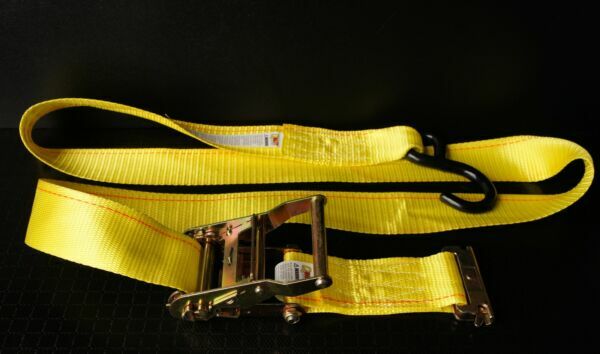 This very versatile strap can be used with E or A logistic track for almost any application. *Before you buy any other Ratchet Buckle Utility strap compare our specifications and ask questions first! Webbing is a full 2" wide and has a breaking strength of 6,000lbs. Webbing is also treated for UV and abrasion resistance. Ratchet Buckle has a breaking strength of 4,000 lbs and comes standard with an easy to release design. Spring E Fitting has a breaking strength of 3,000 lbs and is zinc plated to help prevent rust and corosion. S Hook has a breaking strength of 2,200 lbs and comes standard with HD Vinyl coating to protect from scratching finishes. S hook opening is 1 1/4" wide and will fit over any round bar that is 1 1/4" diameter or smaller. Complete Ratchet Buckle strap assemblies are rated at 735 lb working load limit by manufacturer. Working load limit is clearly printed on sewn in safety tag for easy identification. All straps feature a 10" short or fixed end to keep the ratchet close to your E track allowing the rest of your strap with S Hook to be used as needed. WARNING: Do not exceed WLL (working load limit) for any tiedown. This lot will be shipped from our Just Harris zip code of 97020 to your confirmed address. We strive to offer the best customer service possible. Should a problem arise with an order, we will make it right. Simply send us a message and we will assist you and correct the problem ASAP. We ship via USPS, FedEx, and UPS depending on the order. FedEx and UPS shipments require a physical address. All in-stock orders will be shipped within the specified handling time stated in the listing. Once your order has been shipped you will receive a confirmation email with the carrier tracking number. Please refer to the tracking number for information regarding the location of your package and its status. The estimated and or guaranteed delivery dates provided by either eBay, USPS, FedEx, or UPS are not always correct. Weather and other transportation related issues can affect the actual transit time of your package. For information regarding International shipping, please refer to the listing details for a list of countries we currently ship to for this item. Returned items must be unused and must be returned in original packaging with a copy of any original enclosed documentation. We will issue a full refund on receipt, excluding the original delivery charge if applicable. 1. Goods will only be accepted for return if they are dispatched within 30 days of delivery, unless we have notified you otherwise. 2. The item is your responsibility until it reaches us. Therefore for your own protection we recommend that you send the parcel using a delivery service that insures you for the value of the goods and also provides a tracking number. 3. The cost of returning the item to us is your responsibility. Upon inspection, if the item is determined defective we will reimburse the return shipping. 4. Delivery charges are only refundable where goods are faulty and or defective.